It is a point worth remembering that the Proms were originally launched as a private venture. For the first thirty-two years of their run there was no public endowment of any kind. This was a stalwart achievement. Yet there was no lack of enterprise. 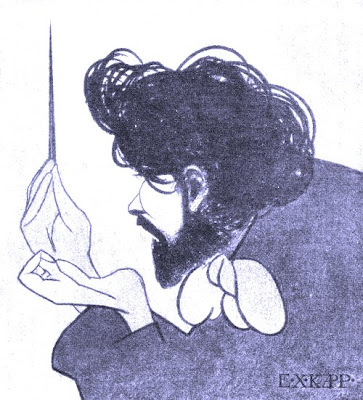 Before the year 1900 well over a hundred works had received their first London performance at the Proms. The total, incidentally, now stands at between eight hundred and nine hundred, of which approximately one-third have been by British composers. Beyond all doubt, the long run of the concerts is largely due to those who in the early days (aided and abetted by Sir Henry) possessed the foresight and the good sense not to build on a 'virtuoso' basis in respect of either artists or composers. The first consideration was, in the beginning as it is now, to present all that is great in the world of orchestral music, whether new or old, classical or modern; and a particular style of concert was thus established from the start. Artist and composer alike have benefitted incalculably as a result. 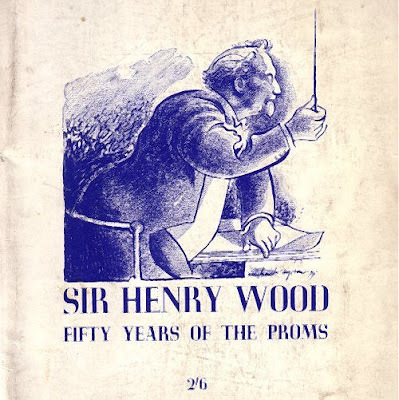 - from W.W. Thompson's introduction to the 1944 book Sir Henry Wood, Fifty Years of the Proms, cover seen above. Below is E.X. Kapp's 1914 portrait of Sir Henry. Tonight (July 17) is the opening night of the 2009 season of the now renamed BBC Proms. I'm listening to it live now on BBC3, and it is just amazing... the Proms is something I look forward to every year! Thx Boon, as I said in an earlier post 'During the 2009 BBC Proms season some fine musicians are playing some great (and not so great) music', and much of my musical education came from the Proms in the era of Sir William Glock and Pierre Boulez. There are many parallels between the Proms and the British royal family. Both have done excellent work over the years and still command considerable respect in many quarters. But both occupy a highly privileged position, and it is questionable whether both, in their different ways, have changed sufficiently with the times. The role of both institutions in the 21st century needs to be debated more openly. It is unfortunate that questioning the role of the Proms is still viewed in the same way as questioning the role of the royal family - 'not the done thing'. I really like the bluey image of Henry Wood that you have posted (him in profile with his baton). I would REALLY appreciate it if could give me some information about the painting - name, artist, your source? Natasha, both images were scanned in from Sir Henry Wood, Fifty Years of the Proms published in 1944 by the then British Broadcasting Corporation. The artist of the upper portrait cannot be identified, the lower is by Kapp and the tint on that one is by me.